There's a very good reason Tetris hybrids flood the iPhone app market; they're addicting. But, still, even the dependable can grow tiresome. If you're going to utilize an old concept at least spice it up a bit. 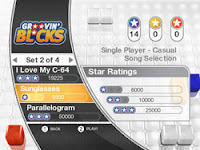 Groovin' Blocks takes a classic game and puts a unique spin on it using a videogame element that is largely overlooked; the background music. Groovin' Blocks offers three levels of difficulty, each adding more complicated puzzle pieces. Similar to Tetris, but more like Columns, in order to get points you've got to align three or more blocks of the same color in a row. When that happens, not only do those three blocks disappear but the adjacent blocks of matching color do as well. Now that you've got the basics, in comes the twist. To exponentially increase the point value, send the blocks down to the beat of the background music. The more beats you hit, the higher the "multiplier" grows and the higher the point value becomes. This formerly Wii-only title has now come to the iPhone and iTouch, via the iTunes App Marketplace to infect a whole new audience. At the completion of the song, your score determines how many stars you earn for your performance and if you've unlocked a power-up. Within each power-up is three levels to be unlocked. As each level is unlocked, the power-up becomes increasingly powerful. With over 50 levels to be explored and a number of power-ups to be discovered, this game has the potential to keep you busy for quite some time. Like I said, Groovin' Blocks is very similar to Tetris, therefore, it's addicting like Tetris. What separates Groovin' Blocks from the innumerable games of its kind is the interaction with the background music. Whether you're prone to tapping your foot or nodding your head, you'll find your body moving to the music. That leads me to the deciding factor of whether or not Groovin' Blocks is worth your $1.99. It's really very simple; if you have no rhythm do not purchase this game. Without a sense of rhythm, hitting the beat will be an achievement based on sheer luck and it'll be nearly impossible to unlock the more advanced elements of the game. On top of that, you'll be missing out on a majority of the fun. On the other hand, if you hear a catchy tune and just cannot stop yourself from toe-tapping or head-banging, you'll thoroughly enjoy block dropping to the beat.